My first reaction was to take a look at competitive virtual worlds. I opened an account in the Open Life Grid, and ordered a private cluster. The initial plan was to migrate the Condensation Land archipielago to Open Life and learn as much as possible in the process, so that I could later advice C properly. I saved all the terrain files from Second Life, I bought myself a copy of Second Inventory, I took copies of all my creations into my inventory, and I started to download everything to my hard drive. What I learned in the process: Building unique objects for the Second Life grid is completely different from building while having several worlds in mind. If you have to transfer stuff to other virtual worlds, you have to be much more organized, link your prims, keep consistent names, etc. (Yes, I was a lazy builder :-)). Indeed, the best way of building is by using your own grid, or a standalone sim, but we’ll get to that later. The building experience was fine, but other things in Open Life were not. Scripts behaved erratically, as did inventory and asset services. A single bad script was able to take down the script engine for four full regions; this was specially ugly when you owned a mainland region, since if a neighbour was using a “bad” script your own scripts would not work and there would be nothing you’d be able to do about it. And wearing inventory worked one time and did not work the next, inventory renames randomly failed to persist, etc. Customer support was very friendly (a very welcome change after the robotic support from the Lindens), but overall Open Life gave me the impression to be a one-person project, with no serious company behind, and I did not feel convinced enough to put all the eggs in that basket, especially after the Openspace fiasco. This proved insightful, because two months later Open Life restricted the use of Second Inventory, effectively locking your own creations to be used only inside Open Life. What I learned in the process: Never, ever build or create contents in a world that doesn’t provide easy, clear, manageable tools to backup and restore your stuff to the same or to another world. Being able to have a copy of your creations in a pendrive in your pocket is a must for virtual world developers. Opensim has very nice tools for backup and restore; more about that later. Since Open Life was not performing as expected and I had read that Open Life was based in Opensim, I got myself an account in OSGrid and started to investigate. Others were investigating too. On december the 18th, 2008, I went to the second Rezzable crash party, and thanks to the nice people at Rezzable, who allowed us to create an account in their private grid to play and experiment, I was able to get a feel of how a small Opensim-based private grid performed. In the meanwhile, Second Life mass land was shrinking fast, and the Lindens lied, as usual pretended nothing was really happening. Opensim was looking better and better, while Second Life was losing the little credibility they had left, if any, and other worlds didn’t look serious and/or stable enough for enterprise use. The only alternative seemed to be Opensim, so that I downloaded Opensim and MySql, created my first region, and blogged about my experience. In the meanwhile, I had to find a solution to my employer’s problems. After a lot of discussions, we decided that I would buy C2, C3 and C4 from them, then they would sell C1, then I would rent C2 to C, and I’d consolidate C3, C4, Condensation South and Condensation SouthWest into a full sim and attempt to sell it. This was a complete and total mess. The discussions at C took too much time, and after the island transfer C1 had to be abandoned because the billing period was over. Then I got a six-months bill for one of my islands, which I was supposed to pay too, even if the fusion of the four islands would have had a paying date of two months in the future, and I had ordered the conversion into a full sim one week before. Since I refused to pay the bill, I lost the four Openspaces (I had already taken all the objects and terraformed the remaining islands, I was furious at the stupidity and rigidness of customer care, and I was not willing to take the time to terraform again Condensation South and Condensation SouthWest, only to have them taken down some few months later). What I learned in the process: If you are absolutely forced to do business with the Lindens (which I obviously won’t recommend, given my experience), don’t even think there will be somebody there who knows about you and about your business. 3,540 US$ + VAT per year doesn’t entitle you to be treated like a customer. They don’t even have a list of how many islands you own, or how much money you spend per month, so that they can care about you and advice you properly. Or if they do have such a list, it doesn’t show. Plan ahead of them, taking into account the inneficiencies of their support system — you’d better do, because you’ll be paying for them (i.e., when you transfer an island, neither you nor the buyer can use the island in the meanwhile — but you have to pay for it anyway, and there is no guarantee about how much time it will take them to implement the transfer; if their queues are collapsed, you pay for their collapse). So that C kept C2, which they now were renting from me, and I was left with only three islands: Condensation Land, Condensation North, and Condensation Beach. I used Christmas holidays to learn more about Opensim; Justin Clark-Casey had published a very interesting article about the future of the metaverse, where a vision of an hypergrid of small, interconnected grids was presented, and Diva Canto was modifiying Opensim to implement that Hypergrid, providing a mechanism to allow teleports between worlds, amongst other things. I tried the mechanism, and blogged about it. I set up a nine-sim Opensim test grid for C, using an old Athlon X64 core duo 3300+ at 2 GHz with 2 GB of RAM. Configuring everything was a little messy, because the server resides inside the company intranet, and I had to do quite a lot of tweaking in the regions xml files and at the firewall; but once everything was set up, the results were fantastic! Using a symmetrical 2 Mb SDSL line, which costed C around 240 €/mo (yup that’s expensive, but there’s no real alternative in C’s zone of the city), we had nine sims working! That’s less than 27 €/mo per sim (< US$ 36/mo per sim), but of course these calculations are nonsense, because you can put as many sims as you want into an opensim installation without increasing the price :-), and without increasing CPU consumption. Indeed, when there’s nobody logged in, CPU usage is near to 0, so that if your use of opensim is on-demand (i.e., if you only need it some parts of the day, for example if you use it for lectures, as is the case with C), you can even use a non-dedicated machine. What I learned in the process: Second Life is grossly overpriced, and their product is monolithic and quite inflexible for educational and corporate uses. The idea of a permanent world is very nice, but it’s unneeded and overkill, and also bad for the ecology; above all, and compared to Opensim, it’s unbelievably expensive. Opensim allows you to switch on your virtual world when you need it, and switch it off afterwards. Since you don’t need a dedicated machine (or even a powerful one), your hardware costs are near to zero, because you can recycle an old desktop from the accounting department, for example. The only thing you really need (and you have to pay for) is bandwith. And this will get cheaper, much cheaper, as time passes. I made some capacity tests: the 2 Mb SDSL line was more than able to handle 15 simultaneous avies! C uses Opensim mainly for education, and they never had more than 10 avies in Second Life at the same time, so that the only remaining problem to solve was voice. At the moment, Opensim had no working voice system, and voice is essential for education, so that I gave a try at Skype conferences. The result was astonishing! Skype voice quality is by far much superior to Second Life voice quality! In particular, 3D spacial voice is a nuisance for education (because it forces you to constantly zoom around the virtual classroom when the speaker’s voice is not audible enough), and Skype’s dynamic feedback and noise cancellation algorithms are so good that most virtual students can attend the class without even having to mute/unmute their microphone. Having tested that, C decided to completely migrate to Opensim, and leave Second Life altogether. They are happily living in their own private Opensim grid now. 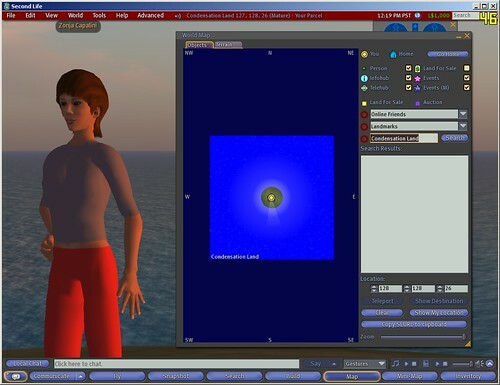 What I learned in the process: Opensim is ready for prime time for educators, at least when the classroom is composed of a small number of students (and this will for sure improve very quickly in the near future). Students and teachers don’t need fancy avies and wonderful dresses; a ruthed student can learn exactly the same as a fancy student avie. And, besides, most people don’t want to spend time tweaking their avie, if the only reason they have one is to attend some classes, as it often happens. Of course, if somebody wants to look nice, there’s plenty of freebies everywhere. 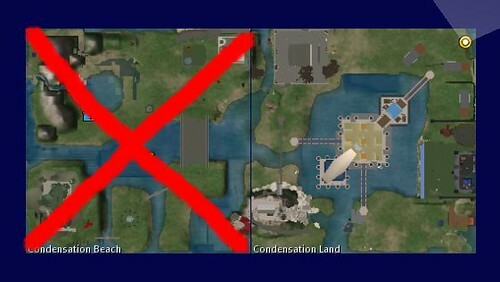 The Condensation archipielago was now reduced to three islands, since we had lost Condensation South and Condensation Southwest. When the six-month billing period for Condensation North expired, we relocated the (few) tenants to Condensation Land and abandoned the island. Now we were left with Condensation Land and Condensation Beach, Ludmilla Writer‘s island. Ludmilla, an RL friend of mine, cannot afford the price increase, and Condensation Beach will be abandoned too. Favio Piek and Ludmilla Writer, co-owners (with me) of Arrabal Tango Club, worked hard to create a replica of the club in our grid. Shoshisn Shilova was so kind as to lend us several of her wonderful sculptures to decorate the islands. The quality isn’t as good as Skype (at least not in the few times that I’ve tried it), but it’s okay, and it does mean that you don’t need to use a separate voice system. Also, the implementation isn’t spatial, it’s region wide (and I’m sure that will remain an option as I can see there is demand for it). It’s too bad most of us have nowhere near the bandwidth needed to host a powerful sim from home. But isn’t that why both grids exist, and isn’t that why LL and IBM work together to make Second Life and OpenSim interoperable? I always thought OpenSim is designated to be more experimental, and Second Life is designated to be more mainstream. The sims in SL may seem expensive, but it would cost more to get the bandwidth in order to run a sim of the same power from home (at least here in california). @justincc: Thanks for your kind comments. Yup, I was aware of the Freeswitch voice implementation, I’m in opensim-users and opensim-dev, altho I’ve not found time to contribute yet. I have to find time to try Freeswitch, if the quality, as you say, is decent, we’ll probably avoid using Skype. Skype quality is superb, but having two clients open is a nuisance, and administering the conference is a PITA. @Court: Well, I don’t know how prices are in California, but what I was pointing out was that for € 240/mo, i.e., for the same price you pay for a single sim in SL, you can have several islands, virtually no prim limit, reliable backup and restore, and full control over your creations and your world. For example, my Condensation Land Private Grid is running on a 2 Mb symmetrical SDSL line too, at the same price (i.e., € 240/mo, that’s US$ 319.08 today, less than the US$ 324,20 we have to pay for a single SL sim after VAT has been applied), and it’s currently holding eight islands: Condensation Land (7153 prims currently), Condensation South (132 prims), Condensation SouthWest (491 prims), Condensation Beach (2225 prims), Condensation North (1133 prims), and three private sims more. If I were to rent 8 sims in Second Life, and assuming only C. Land was a full sim, I’d be paying (295+7*125)*1.16 = 1,352.20 US$/mo instead of the 342,20 I’m paying. That’s a savings of 1,105 US$/mo, enough to pay for a part-time specialist! And in SL we would not have reliable backups, we would suffer arbitrary prim limits, etc. And broadband prices are getting down, fast. There’s an ISP in Spain (Ono) with a fiber cable offer with 50 Mb download and 3 Mb upload rates for € 50/mo (unfortunately, not still in C’s or my zones of the city). 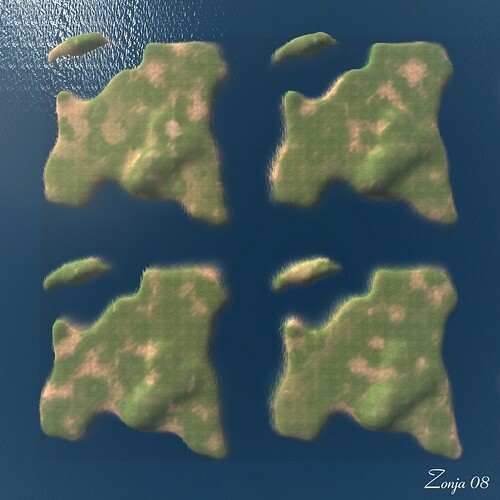 If Opensim performance scaled linearly, I would be able to have 8 islands with more than 12.000 total prims for € 50/mo and have more than 23 concurrent users in the world. Excellent post as usual, Zonja. You might be interested to know that there is a region module one can add to opensim that lets the estate manager save region content by going into the save terrain and specifying ‘.oar.raw’ as the file extension instead of ‘raw’. This would let you backup your region even if it’s hosted on somebody elses grid. Very nice post Zonja. Thinking in get independence from LL, i always used external tools to build like primcomposer, the nice plugin from Shack Dougall to 3dmax. And i tried, working with some friends, to help at the users to test opensim and than they hav the posibility of left SL. so many beautiful things, I understand they are hard to leave. I hope your post will encourage some friends to follow in your footsteps. Thanks for sharing your experience and your knowledge. Gracias, Albert! :-) Oh, in case it didn’t show, I’m an Opensim evangelist myself — right now the granddaughter of a friend of mine is playing with a local copy of Condensation, for example :-) I think the real battle will not be a battle for grids; that battle has already been lost by the Lindens, and by any big grid, for that matter. Seen in perspective, having your islands in a grid is like having your pages in a service like Google sites: something quick and easy, used only by people in a hurry or by amateurs. Professionals make their own webs, and will make their own worlds. OpenSim is awesome and the folks at OSGRID couldn’t be nicer. I set up a 4 region grid and connected it in a short amount of time. Lets see…. 4 regions, no tier fees, using my current DSL connection. Linden Who… Second What?… LOL! Goodbye Second Life!! I read it all, wanted you to know that. I do not understand many of the technical expressions as I never bothered with that myself, those things one understands doing, not being told about. I will not say something original or new telling you I am awed by your competence and sense of purpose crashing though obstacles you never know how thick they are. And what new ones you will have to master then. You know how highly I think of you as a person. I will be your incompetent test person if ever you need one who will pester you with naive queries about details I am stuck on. Maths teachers used to dislike me strongly for that, I was only cheekier than the others who took what they did not understand like ducks take raindrops and did not understand why I kept asking questions about stuff that no one but teachers were interested in. Thank you so much for all the time you must expect to spend on instructing your old klutzy me. I know you have an angelic patience and you are a gifted paedagogue. You will be able then to boast an award “I mentored Mikil Tiki” which will be a badge of excellence of your superior skills, recognised intergridally with my full warranty, lol. Thanks Zonja, that’s a great posting and a fantastic summary of experiences and options. Pretty much an eyeopener! – and you have done a fantastic job of documenting the aftermath. I bow at your feet. Excellent article /expose on the practices of both Linden Lab and OpenLife grid (we too found OpenLife to be more of an amateurish attempt at a one-man operation than a professionally run company. We left when they shut down a sim due to their own inept accounting practices and total apathy for customer welfare). The astounding thing about the OpenSpace fiasco were the totally fraudulent claims presented by Linden Lab. They stated the OpenSpace sims were “abused” by customers and thus put undue strain on their asset servers. As a result, by mid-Feburary some 5,500+ OpenSpace sims were shut down by angry customers. Has asset server performance improved as a result? No, just the opposite– it’s gotten worse. We now have problems such as ghosted prims, total cache malfunction, and an ongoing 2-year problem with simple chat and group notices not working. It was obvious any asset degradation was caused, not by OpenSpace Sims, but by very poor Linden Lab coding and company mismanagement. It’s obvious from the numerous posts in just this blog, that Linden Lab has been dishonest with its customers for quite some time– and have been destroying their own system fror quite some time. These blogs are just the tip of the iceberg of web-exposes regarding Linden Lab tactics. The result: I and several other pros I’ve spoken to are predicting the demise of Linden Lab and/or Second Life (at least as we currently know it) within one year. It’s pretty scary when the industry analysts start openly making such predictions. It’s means they’re pretty sure of the score. For me LL has been died since their newest stupidity with Ursula and deal about and with are still to expensive and terrible to handle. People are leaving Second Life by the thousands. As of mid-February, more than 5,500 sims had shut down (20% of the Second Life sim count). Linden Lab’s bogus claim that people are switching from Open Space sims to full sims is completely unsupported by documented data (I doubt at this point anyone trusts Linden Lab’s word on the matter). The pros have stepped up: the fall of Second Life as we know it is predicted for one year, at the outside. I’m one of those who have stepped up and made this prediction on my blog sites. Linden Lab has run Second Life like some kind of personal toy while using other people’s money. But more and more people are now switching to OpenSim-based grids. Our group is one of them. We’re pulling all our eggs from the Linden Lab basket and investing elsewhere, preparing for the eventual fall of Linden Lab. I would have to say at this point, after their heartless and apathetic attitude toward customers in the Open Space fiasco… (dare I say just plain goofy) such failure is quite predictable. I would love to visit your regions — are they hypergrid enabled? Can you give directions? It sounds like a great project. Zonja – Just discovered this post. You don’t fiddle around… what an update! This topic is looming on my mind as July grows near and tier will go up another $35US a month for my Homestead sim, Chakryn Forest. I still haven’t forgiven LL for that fiasco and it is going to be very hard to swallow that kind of money every month. Still, so much of my work revolves around Second Life that I can’t see myself moving just yet. In the meantime, let me express my gratitude to you for pioneering this space for us. @Bettina: Many thanks for your appreciative comments! I’ll be keeping the Condensation Land sim in SL, I’m not prepared to leave entirely myself either. fyi, why repost on maxping? This was an amazingly detailed and insightful article! I’d like to learn more about how you set up your OpenSim server behind a firewall – my school is trying to do the same thing and we simply cannot connect from off-campus. I’m sure it’s something simple, like an entry in the opensim.ini file, but I’m a complete noob right now. Where can I go, who can I contact to get some ideas on what to do? @Mediajolt: Thanks! :-) If you’re using NAT, you need a firewall capable of port forwarding (a.k.a. port mapping). Then forward all the ports used (i.e., 8002-8006, and all the ports for the simulators) to the internal machine. Finally, configure the external ip address in each region xml file (the external_host_name attribute) to point to the external ip address (or host name). Then you’ll be able to access your Opensim from off-campus, but not from inside the campus:-( This is clearly something that needs to be fixed. My customers access the server by using a second ADSL line and shutting down temporarily the LAN network adapter, so that they can get to it “from outside”. Another, simpler, solution is to have a dedicated external ip for your Opensim machine (that’s what I’m doing at the Condensation Land grid). It sounds to me as if both you and your company simply don’t have the capital required for the ventures of the magnitude that you wish, and are trying to get bargain rates on everything and cut corners — and the results are obvious. If the raise from $75 to $125 is such a deal-breaker for you, why be in this business? SL sims aren’t overpriced, when you consider that you get access to loads of content and an interactive world. OpenSim might be fun to have your own sim to prototype on, but can you take that content to another sim even on that grid? And it’s a wasteland — what else is on there? Other people who, like yourself, want to work in a silo and copied only their own content with Second Inventory, which interestingly, you say can’t be used now. And that’s good, because it sounds like a vulnerable place for a leak of content without permissions adhering. As for your billing issues, I’m not getting it. So, you got the use of the sims first without paying them — that’s how the system works. Then, towards the end of the month when the tier bill came due, you whined about the price hike and suddenly consolidated your sims, and expected then to get another 2 months’ of a consolidated sim for use, without having paid for their previous use as openspaces. Huh? You have to pay for the tier used after you pay it, at the end of the month. Why would being a $3000 or whatever customer somehow qualify you for exemption of tier? There’s tens of thousands of people just like you. So somebody busy a L$10,000 castle and “tons of other stuff” and puts it out on a sim? Then they complain that a light-use sim doesn’t work right? Right, it doesn’t, because it isn’t designed for heavy input. I understand your critique, Wayfinder, and in many ways it’s legitimate, but you will find as others, including myself, have found that OpenSim merely opens up a whole new can of worms and many problems you’d never face in SL. At least LL has a copy/mod/transfer regime that in principle works, even if it is hacked, rather than a resolute anti-copyright attitude that doesn’t even make c/m/t work to start with. There’s also no stampede of people leaving SL. People whine and pose in various stages of drama but they don’t truly leave. The use case you describe, of a sim that only needs to be up a fraction of the time rather than 24/7, sounds like a good fit for Amazon’s ECS. Had you looked into that? Bandwidth and CPU time from Amazon might wind up costing less than just bandwidth for a residential line, depending on usage. Excellent article, I’ll be looking into this myself. Thanks! In the non-released concept application “Tribal One” – http://lbsa71.net/tag/tribal-one/ – we, among other things, showed how you could use OpenSim to launch regions-on-demand, and even parcels-on-demand: when a person entered the world, he got a persisted home parcel allocated on an home region, if the region was full, another one was created automagically. When he logged out, the parcel was stored and vanished. If a region had no allocated parcels on it, and no visiting avatars, it would close down. An auto-expanding-and-contracting on-demand grid. Too bad we never saw it fly. But it’s a good “another way” example. @Tinker: I was aware of Amazon ECS, yes. I even think there was a company (can’t remember its name now) that was selling exactly that: sims on demand. Re: voice: haven’t tried all the alternatives, only Skype and Webex, but SL voice seems not to have feedback cancellation algorithms for environments mixing RL and SL, where you can hear the virtuals in the RL classroom via the sound system. With SL voice we had to lower the volume too much to avoid coupling; this does not happen with Skype or Webex, where the virtual’s voices are heard clear and crisp, and there’s no coupling. @Stefan: Tribal was full of excellent ideas. I think that sooner or later these will be recreated/adopted by the Opensim community. The company doing Amazon hosting for OpenSim is Sim-OnDemand: http://sim.ec29.com/. I recently interviewed the owner, but haven’t posted the article yet. Will be doing that in the next day or so. For two or three hours a week, he estimates that the cost will be around $10 — and go up to $100 a month for full-time use. He’s got around 35 customers using this product right now. But I also just talked to ReactionGrid — their basic price for a region on a shared server is just $25 a month (for up to 6000 prims) and that includes all the maintenance and everything. And they’re focused on the education and business uses, so they might be a better fit — and a better bargain. Such a good article Zonja, :) I’m a professional content creator and have been annoyed and yet protected by the SL permissions. I also run a local opensim for development. Seems to me, Digital rights management (DRM) is the key issue to how pen Opengrids/Hypergrids will become interoperable in the future. At the moment if I sell content offline I risk seeing it being resold without my perms on SL or any other grid. This means I have to charge realistic real world prices for my Animations, Textures or Objects or pay a lawyer to chase people if I want to make them available offline. I mainly make an income in doing specialist work offline for companies and as such, get paid RL rates, Its then their content etc… But that doesn’t help the average person wanting to buy content cheaply. Once this issue is addressed with a common framework that is interoperable across any grid, the Virtual economies will provide excellent employment opportunities for content creators. It has the chance to become a huge employment growth area for the RL world economy if handled well. Until then, if anyone wants dance, walk, fly, emote animations etc.. or truly professional textures outside of the grid for use in virtual games. They will have to pay significant RL prices directly to professional animators like myself :)(there is a lot of work and skill in animation) that’s fine for me, but I would like to make my animations and pro textures available for OpenSim, Openlife residents cheaply, like in SL, but the risks are just too high, I’v already been ripped by several people and it leaves a really sick feeling when someone steals your creativity and skills to sell to others. I would really, really like to know where this stampede of people is? Who were they? Is it your circle? Not a single one of the content creators and business owners I know in SL had or have any plans to leave SL, and these are incredibly heavy users. I’m going to mark this date, Wayfinder, and if SL closes doors within one year, I’ll give you props. If it does not, well, we’ll see. It’s not a stampede yet. Just a slow steady trickle of regular smalltime users like myself who don’t think Linden Labs/Second Life is a good value. 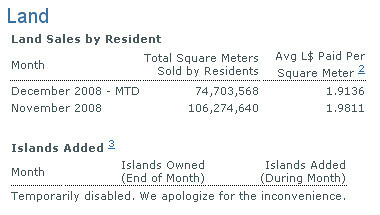 I can’t afford $195.00/month for tier fees for a mainland region or $295.00/month for an island. But using opensim I can run my own region(s) absolutely free using my current equipment/connection. I got on Second Life to socialize, meet new people, and create a few things. If I can do all that for free and have access to some really nice content within OSgrid, then thats where I and alot of others are headed. And as for content creators, Linden Labs isn’t really doing all that good of a job protecting the vast majority of you and your IP rights. Copying is rampant all over the SL grid. Opensim/OSgrid also presents a level playing field as far as business goes. With no grandfathered tiers, no special deals on land, everyone is able to compete on an equal basis as far as basic business expenses go. No matter how big or small we are all paying the same tier. None. hi, me again with a second comment. I think you’ve convinced me to look into OpenSim (if i can just get the client to run). My projects are very large and more focused on art than making money, and that means major fees in Second Life. It looks like it can be cheaper than I thought, as there’s game server hosts that offer several different server configurations for a pretty cheap price. @Anizia: Thank you! :-) I think there is a common misconception here: to assume that all Opensim users are hackers that will quickly manipulate the back-end databases to steal property. First, not all Opensim users are SQL gurus — most are not. Second, I don’t see why Opensim users should be more prone to steal than SL users. Third, everybody who has researched the subject knows there is a plethora of tools (Second Inventory, prim replicators, Copybot, glintercept, …) to duplicate SL content, be it following the SL TOS or not, and that these tools are being used — just pay a visit to many freebie stores in SL. And still, most users prefer to buy their stuff in the original stores. What I’m meaning is that if somebody invented a mechanism of selling stuff to the Opensim grids, this wouldn’t necessarily mean that the merchants who sold their stuff using that mechanism would be more exposed to illicit copies than those using the current SL mechanisms. And such merchants would have a bigger market than if they sold uniquely in SL. @Court: Well the cost is US$ 0 if you host Opensim in your own machine, which is enough for content creation and development — and it’s much faster :-) And you’re right, there are very cheap hosting solutions that are quite affordable, in any case much cheaper that LLs offerings. Some make their products on an OpenSim grid, and sell on xStreet (like ReactionGrid’s Elf Clan is doing). Some sell their products on OpenSim grids for V$ (which is a piggy back system based on Linden Dollars). But the more interesting approach — currently being worked on by several different groups, including ReactionGrid — is to use the existing web-based payment infrastructure, such as Google Checkout, PayPal, and PayPal Micropayments (https://www.paypal.com/IntegrationCenter/ic_micropayments.html). By using a real payment system, merchants are able to charge more money — after all, people are willing to spend $4 on a supermarket tabloid they’ll toss after an hour, or $0.99 for an MP3 file they might not ever play. Finally, the big use cases for OpenSim right now are not retail commerce. They’re business training, meetings, conferences and primary and secondary education. The folks need presentation supplies, furniture, and decent business clothes — and they can afford to spend a little money to pay for them, and they’d rather not be wearing stolen property. After all, a virtual conference is replacing a real conference — with a $1,000 plane fair, plus a hotel room for each participant. Finally, about home-based regions: I run two regions on my old family computer, running 0.6.4.9395 on a standard cable Internet connection. It’s been up and running well for over a month now, and the only time it went down was when I bragged about how it never goes down (like, ahem, like I’m doing now). And, in that case, all you do is restart the region. I’ve been able to have small groups of visitors without any problems — up to four people at a time, with no discernible lag, even in one case with a guy wearing a 4000-prim animal suit! One regular visitor is my kid’s dad, who teleports in from Shanghai. For a company holding one-on-one or small group meetings only, this is a great solution, if you have a spare computer and some bandwidth. Then, if you need a bigger space for a few hours a month, there’s the hosted Amazon cloud offering from Sim-OnDemand (http://simondemand.ec29.com/index.html) which can scale up and down as you need it, and you only pay for what you use. For about $6 or $7, you can get a region for 10 hours a month… a full month would run you around $100 (this is not an exact number — it varies based on how much stuff and how many visitors you have). A basic region on ReactionGrid is just $25 a month, and they handle all the support and maintenance, plus supply you with a basic startup configuration — business conference center, or classroom, or historic site. And for someone looking to run a completely private grid within their own firewall, you can get the Banbury server from Reaction grid for $8950 base price, pre-configured, able to run nine regions on a typical deployment, with maintenance and upgrades included. 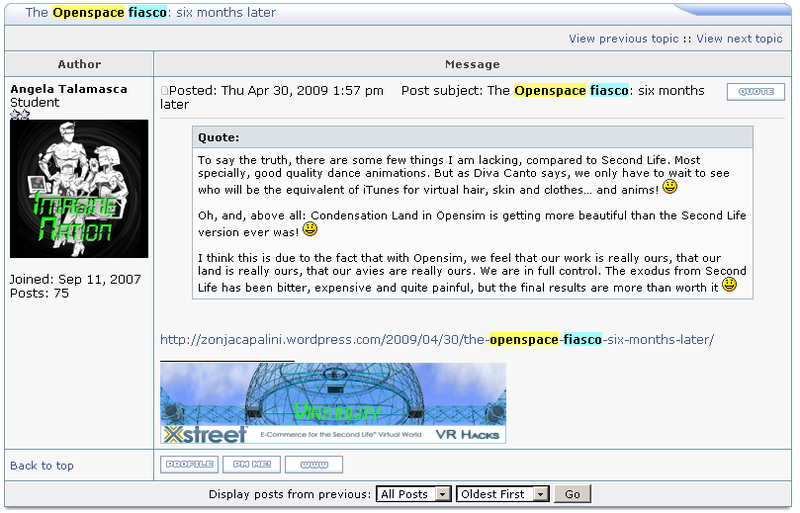 People sometimes look at OSGrid — which is a development grid — or private regions — and think that OpenSim is unstable and unready for business use. In fact, OSgrid is testing new version of the software every day, so it is only expected that the region and grid would continually go down — they’re looking for bugs, finding them, fixing them, and adding new features. Many home users also like to use the latest version of the software, before it’s been debugged, or run on intermittent connections, or trip over their power cables. The big hosting companies, including ReactionGrid and PioneerX, thoroughly test the software upgrades before rolling out new versions on their grids, schedule downtime and maintenance according to customer needs, and run their operations on stable servers, with continuous backups. PioneerX, ReactionGrid, and Sim-OnDemand have dozens of customers already using their services, despite the fact that these offerings only just rolled out, and hypergrid teleportation has only now started to be reliable. These customers include individuals, educational institutions, and both small and large corporate customers. Last week, we formed the Hypergrid Entrepreneur Group (http://www.facebook.com/home.php#/group.php?gid=87030777540). Two of the first members were venture capitalists — so I think we’re about to see some significant investment and development in this area. @Maria: Many thanks for your very detailed, documented, and thoughtful comment. There’s only a doubt that comes to my mind. You speak very detailedly about facilities offered to merchants, but I don’t see a mention of the places that we, the buyers, should go to get our stuff. In respect to the idoneity of SL/Opensim as a teaching platform, I do have my reservations, but I will write about that later. With a ReactionGrid account, you get one of six free starting avatars, and you start out at the Welcome Sim, which has a little freebie store right near your landing spot (just walk over a little bridge to the little glass dome). If you’re not on OSGrid yet, you have to find an HG-enabled region to teleport out from (on ReactionGrid, those are HG Gateway 1 and HG Gateway 2). If you’re on a standalone, you will need to connect your standalone to the hypergrid (set hypergrid=”true” in your .ini file and include the lines WorldMapModule = “WorldMap” AND WorldMapModule = “HGWorldMapModule”). You can also jump to the grid’s Business Center, also HG enabled: 67.222.146.126:9990. The Business Center has a free shop in the south west corner, with some business suits and office furniture. One you’re on OSGrid, go to Map (bottom left) and type “free” into the search box. Several freebie regions will come up. Best clothes, skins, animations, and hair: Freebee Megabarn, in the Freebee Megabarn region. Land right in the center. Best textures: Open Simulator Texture Library. Region: Vette Haven. Coordinates: 188,27,27. Best garden supplies: Garden of Eden region. Land right in the center. Anything with “freebee” in it is more or less a copy of the Freebee Megabarn and has a similar selection. Wright Plaza also has a freebie shop, at 73,208,21. There’s some nice furniture and shoes at SANA, in the Snoopies region, at 152,196,21. You make some good points and I will look into coming to Opensims very soon :) really liked your pics too btw :) you obviously have great skills. I don’t have any worries about selling offline to clients cos I know who they are and how they are going to use the digital media content. I’d also say that most people in Sims are 100% trustworthy, but it only take a few to wreck a business. One of the big texture stores in SL ‘Textures R Us’ were kind enough to let me know of some people who were reselling my textures, techically they are competitors (they are much bigger than me) but I concentrate on high quality and specialised work. I think most people look out for each other in the VR world, its part of why I like it. Animations are better protected and thats good because they take a lot of time to create to a professional level, I make them for film and tv mainly and the files are pretty much discarded after the actual production is completed. Most film studios tend to use MoCap these days and then tweak and refine them. (its very expensive to hire and use) But a true animator should be able to make them manually from ground up. Making them for Sim’s and games has a lot of quite different limitations by comparison and getting smooth work for generic movements is quite hard, as a lot of the subtlety is lost by the rendering engine and network playing speeds when you upload and play them… but at least they can be re sold as standalone bvh files. It’s easy to change a texture image file, but much harder to change a bvh file without stuffing up the ins, outs and keyframes. Now I’m rambling, sorry… Time for groups of people with different VR skills to get together I think… Most of the public just want to play, have fun or educate and communicate. They are not interested in the tech or even creative tech side… and most importantly, they don’t have a lot of money to spend.. that’s where SL is really getting it wrong by charging so much. There are millions upon millions of people who haven’t even begun to visit VR worlds yet, Catering to them needs to make the tools easily accessible, high quality and cheap enough to keep them coming back for more. I’d be interested in talking to you offboard, but I can’t see a contact page or email addy. Mine should available in your admin I think or my contacts page on the website http://aniziagraphica.com. Really interesting read Zonja! I have been meaning to look into alternative grids. I was spending too much money is SL just to have a bit of land I could have looking nice and host parties and meetings. Trouble is I’m not a geek – I’m an artist, designer and youth worker – How straight forward is it really for a layman to setup an opensim on a spare PC and connect it? I get scared by code. Are there any people out there that could help me? Please. An idiots guide would be brill. From sad stories come new beginnings. Opensim is somewhat like space travel, new beginnings to exciting and yet to be discovered places. Up till now Linden Labs has held somewhat of a monopoly. Yes, you will get wizzened old ludites like Prokofy Neva proclaiming the earth is flat and only commies and terrorist’s will go to Opensim. But without people like Zonja paving a way thru Opensim, we would be stuck in SL renting old has been rooms in the old Ravenglass fur sims. Oh, yes, and i recognise the old bait & switch techniques that Lindens used with there openspace sims. Many got stung, but Lindens time will come. Thanks for your comment. As soon as there is a stable version of Opensim which works behind a standard ADSL router AND a stable version of the hypergrid, I envisage a big exodus from SL. The main problem is, of course, quality content. But that’s only a problem of critical mass. As soon as there is a market for it, there’ll be somebody imagining a device to sell in Opensim, and making big money with it. “a stable version of Opensim which works behind a standard ADSL router “. Very true. Having investigated and got my own grid up and running(not standalone), I suspects its 50% Opensim and 50% router. Its a question of NAT “loopback” and does the router support it. I have numerous routers to and none worked except my Linksys wag54g which worked straight off the cuff. I only had to forward the ports as usual. Other routers are the newer D-Links of certain models. At the end the day a router needs to be able to say “Hey, I’ll look for myself from the outside and find myself”. This is known as NAT Loopback and is closest to an “Open Ended connection”. I agree that OpenSim does need to become end user friendly, but it is challenging. The router problem is the same one you get if you try to host a website on your own computer. People used to do that too, when the Internet first came out. But these days, who hosts a website at home? A cat trips over a cable, and the site goes down. A kid turns off the computer by mistake, and the site goes down. Your cable goes out, and the site goes down. 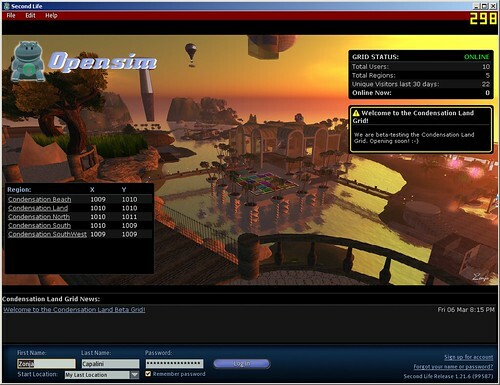 Today, you can get an OpenSim region for $15-$40 a month, depending on hosting services. That’s a quarter-region for $4 to $10 a month — similar to website hosting prices, and plenty of space to put up a house or small company office. And several companies are giving away free 1/16th regions (one acre size) for homesteaders, though usually the number of available plots is small and fill up fast. There’s no one yet doing it on a large scale — but it’s probably a great business model (rent out retail space in a village center, give away free residential plots or apartments all around). I would bet that by the end of the year there will be a LOT more competition in the hosting market, and lots of available free land for homesteaders. There are two fairly simple but central evolutionary steps that can, and hopefully will, be taken with OpenSim: one, that all backend services can migrate onto ‘standard’ services; Standard CMS hosting of binaries and inventory; existing authorization and profile implementations (there’s already been done facebook, drupal, dotnetnuke and elgg integrations, but none of them has been released to the larger public as modules – yet) and two, sim-on-demand, that all sims are stored to database when not used, and re-awakened on demand. This would lead to a more web-like cost base where all cost is in the production of the actual impression. If we had that, the cost to host on-demand regions would drop to prices comparable to cheap web hosting. It took a long time — a decade? longer? — before we had decent CMS systems for the web. I remember working for a magazine ten years ago that spent over $1 million for a content management system that didn’t do half of what, say, Drupal does today. The rest of us had to build websites the old-fashioned way. By hand. With HTML and Dreamweaver. Uphill both ways! But did we complain? No, we did not! Okay, maybe we complained a little bit. Anyway, if someone has the time on their hands to build a useful utility for OpenSim, I’m begging — BEGGING! — for a decent web-based client. 3Di in Japan has one (in Japanese!) — so it’s certainly possible. And with the new Google O3D, maybe even straightforward. Ideally, the client would allow you to enter your default avatar and your default grid (the same way you now enter your default email client and your home page) and would support transparent Hypergrid teleports (maybe even automating the intermediate jump process for far-off regions or regions not HG-enabled). And if it could save and access inventories locally, that would be even cooler! 1. “The router problem is the same one you get if you try to host a website on your own computer”. Not really. Webservers can deal with incoming connections. Loopback is a problem for any “game” server that needs to connect back to itelf. 2. ‘OpenSim region for $15-$40″…could I get a link please. 4. “maybe even automating the intermediate jump process for far-off regions or regions not HG-enabled”…I would read Zonja “A problem of trust”, and Opensimulators article on the Hypergrid. 6 “If we had that, the cost to host on-demand regions would drop to prices comparable to cheap web hosting.”…cheap webhosts allocate as low as 50mb RAM on a VM, or 150mb if you are with a good host. Total RAM for a 10 AV region is Minimum 1gb. Businesses require predictibility so who will provide that? IBM probably, as that is what they are working on. On, and don’t count on IBM to bring the prices down. The charge for the Lotus Sametime 3D product — which is four regions — is $50,000 — plus a maintenance contract. (Of course, you also get integration with your other applications, Vivox, and a bunch of nice business collaboration tools that IBM made). There’s Vivox on OSGrid, too. Vivox is the directional voice, like what Second Life has. I hear they’ve got it running on the plazas, and I’m looking forward to trying it out. Meanwhile, about Hypergrid: the way it works now, is fine for me. I run a standalone region for my company, and two home-based regions for the family, plus another region on a grid (OSGrid). I travel between them — and to all the other grids on the hypergrid — daily. There are problems, sure. And sometimes the hyperlinks don’t work. But if I wait a day, I usually find that all the problems have fixed themselves. Including the ones that the developers say are unfixable. I feel sorry for content creators, but as a business owner I don’t worry much about content being stolen from me — all my proprietary content lives on the regular web, and can be stolen anytime, anyway — the value of my business is elsewhere. I am concerned about not accidentally violating someone else’s IPR. That would make my company look bad. I don’t believe it will take millions to write a decent web browser for OpenSim. The desktop version of the code is already there, in open source. The O3D api is there from Google. It will probably be some kid in a dorm room who’ll connect the dots and become the next Netscape. If any of those kids are reading this: I’ve got potential investors for you. Get in touch with me. I advise against relying on a kid in a dorm room to base a business case on. Re hosting reviews: what i would like to see in hosting reviews is a standard comparison table. EG: CTP – cost per thousand prims. Bandwidth allowed. On demand or not. AV limit. Things have to be clear, not vague, like that lead to the whole Linden openspace cost/av/prim debacle. Us adults are standing around complaining about the lack of support, reliability, IPR protection, and business plans, the kids in the dorm rooms are busy doing actual projects. Many of today’s giant Internet companies came out of dorm rooms — I would expect the same to be true of the 3d Web era as well. I met one of these kids while in Shanghai last week – unfortunately, he’s not interested in getting a job working on OpenSim projects. He’s too busy starting his own company. And, also unfortunately, he doesn’t need investment money right now — he already has paying clients, plenty of classmates willing to work free or cheap, and since he still lives with his parents, he’s got no expenses. And there are kids in Russia, Ukraine, Latin America — and all over US and Europe — doing the same. Sure, they have no management skills or business plans or cashflow statements. But I wouldn’t count them out! Come on. Despite Linden Lab’s shortfalls, they are a strong production grade development company. Even now they struggle to advance their 3d viewer beyond what it was 4 years ago. Yes, “giant” internet companies often did come from small beginnings, but these are from a few true business visionaries that in turn hired talented people, and became corporate structures. As for kids in Shanghai, surveys by development companies show they can’t carry big projects to the end. I do not think we are adults standing around complaining. I have been impressed by the pragmatic way that OpenSimulator is proceeding in a mature way, companies like IBM are contributing, individual techies are beginning to come on board, and people like Zonja, brings in a broad mix of skills. Her writings, especially her “Open Space Fiasco” article has become the benchmark for everything that is wrong with Linden Labs, and why finding a way forward is desirable. To say all these contributors are wasting their time till a magic bullet comes along in the form of some whiz-kid who can string together some code is naive. The Hi-Pi-Hi project is case in point from something coming out of China. From media releases promising a lot and over SL to media commentators saying it is merely investor dtiven hot air. I’m not saying that anyone is wasting their time. As far as I’m concerned, OpenSim is already a decent enough environment for me to use in my business — and it just keeps getting better. However, China (and Korea and Japan) have a ton of young talent experienced in 3d game design. Adam Frisby’s DeepThink has its main base of operations in Shanghai, and they’ve been doing a lot to move OpenSim forward, for example, taking advantage of just that labor pool. The hypergrid, IPR and asset problems are probably all going to be solved incrementally. But a decent browser might well be one of those game-changing events, like the arrival of Mozilla and Netscape were for the Web. I’m not holding my breath until one appears, but am certainly looking forward to that day — and will do what I can to bring it closer. @Maria I just tweeted http://tr.im/smnf – Sketchup-to-Prim converter. Over these years, I’ve come to conclude roughly the same as you: the commercial sphere will not ‘connect the dots’. Although they will provide the money and commercial use cases, I believe the trenches of ‘local optimization’ are too deep. There is quite a lot of disjointed technology out there – people are churning out OGRE-based apps daily, there’s stuff like silverlight and shockwave, but so far, nobody’s pulled it all together. One could cite lack of standardization, but then again, that would be a catch 22 as standardization has to be driven by use. We already have VRML. We have LLPS (Linden Labs Protocol Suite), X3D, Collada, MXP, SETP, CICP. All of them solving too much, none of them solving enough. What is needed is a stack approach, which is why I’m advocating ripping stuff out of LLPS and solving what is not strictly world-content transfer related over other protocols. In time, we’ll get there. OpenSim was not meant to be the solution – it was meant to be the toolbox for somebody that thought they had the solution. With Melanies and Divas recent work on transforming the old “UGAIM” backend architecture into the new “ROBUST” architecture we will hopefully see even more use cases being adressed with pluggable backend modules. Indeed. HTML 5 is an example that will bring together all those technologies into one open platform. Microsoft hates HTML 5 of course as it will make Silverlight irrelevant. If Adobe is smart, Shockwave will become an IDE or Editor for HTML content. Breen — Very cool, thanks for the link! I finally got around to reading your opensim blogs here. Wonderful stuff and thank you for documenting all you went through. Now that the summer is over, I my have a few evenings free to begin playing with OpenSim. I’m really curious how parallel the in “game” development is…scripting terraforming maps etc. Thanks for the push in getting me to finally check this out. Hi! :-) Glad to see you here, thanks for your nice comments! :-) You’ll see for yourself, but Opensim is practically indistinguishable from SL nowadays, in most areas. I can create a free test account in my grid for you and show you a nice sample of what can be done there :-) Scripting needs some care (there’s a nasty restriction about loops, this is an area that clearly needs more work), terraforming works ok but some improvements are needed at region crossings, maps do work but there’s no comparison with SL. A little late to the party, but wanted to say nice article. I’ve completely migrated from SL to a private grid after a couple years of working with it. It’s a great bang for the buck no doubt and daily it gets better. Quite a bit to look forward to with opensim. Try a 4 or 6 region megaregion. Works pretty nicely. Not late Tracy…Searches on migrating from SL shows this article up on google, and it has had fairly regular comments since it inception back in April. This article has sort of become the “Ground Zero” of why people move from SL. Keep us updated on your progess. @Weed: Exactly. They can’t lower their prices because it would crash the “land market”, but paying US$ 295 for a *core* is simply ludicrous. And lately they seem to be less enthusiastic about opening their platform, M Linden has already confirmed (in an interview in Massively) that they have no plans to opensource the server code. Closed systems are doomed to fail. My impression is that they are trying to grab as much money as possible to get some ROI back for their venture investors while profits still last, and then they’ll be forced to close for lack of customers. 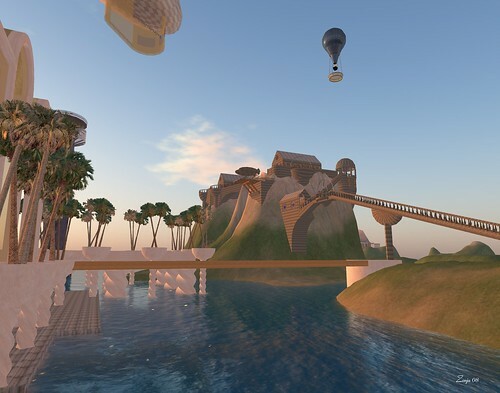 What would really open up Second Life, however, if they allowed teleportation between Second Life and other grids — both private grids run by customers on the Second Life Enterprise server platform, and on OpenSim grids. This will allow competition for land, bringing down prices dramatically. Yes, this will probably also bring down the prices for commodity-type virtual goods, and makers of branded goods will need to step up their copyright protection efforts. Right now, the Second Life/OpenSim platform is the closest thing we’ve got to a virtual worlds standard. Allowing teleports will help cement it as the standard of the future — Second Life’s user base combined with OpenSim’s flexibity and low cost is an unstoppable combination. Otherwise, it will leave room open for a competitor to enter the market with a better, cheaper, interoperable product.